TEMPE, Ariz. -- Rob Edwards didn't need to take many shots to have an efficient performance for Arizona State. "Just trying to get confidence for March and tournament time," Edwards said. "Just trying to pick it up and help everybody else so that we can get ready and win games. That's what we've got to do." "I don't think it impacted our shooting. I think it impacted the game because he is so talented, but the guys that were shooting the shots were the guys I wanted, and they are very talented," Haase said of not having Okpala. Part of it was just our pressure," Arizona State coach Bobby Hurley said. "We were just really speeding them up some and we didn't allow them to go side to side." "They have a very talented team and they were able to get enough makes to never let us get too close," Haase said. STANFORD -- The Cardinal play three of its final four regular-season games at home, and of the four, three teams are the bottom three in the Pac-12 standings. With a strong finish, Stanford can possibly get into the top four in the conference going into the Pac-12 Tournament and earn a bye to the quarterfinals, which is beneficial. ARIZONA STATE -- The Sun Devils' home finale is Sunday, then they end the regular season with three road games. Two are at the Oregon schools, both tough at home, and the last one is at rival Arizona, a test despite the Wildcats' struggles this season. Staying in the top four for a first-round tournament bye is still a strong possibility. "I had a feeling that we would deliver, and this is my gangster' shirt and the guys played like gangsters out there. They played hard, they took control of the game, they battled, they fought. "HIGHLIGHT REELWith the outcome not in doubt and 40 seconds to play, Martin's sixth and final assist of the night came on a mid-air, look-away bounce pass between his legs to De'Quon Lake for a dunk. "Just tried to figure out the quickest way to get it to him," Martin said. "It was obviously a little bit of flair, but I just got it to him any type of way. That's just my playground style." 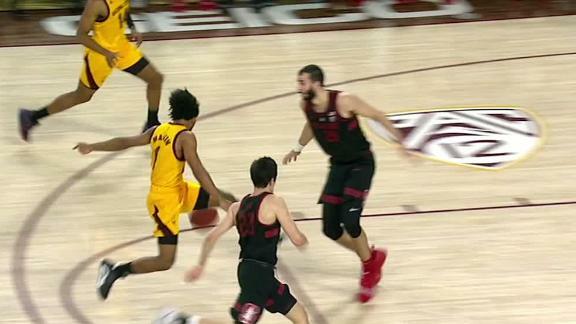 Scott Van Pelt loves the multiple between-the-legs passes thrown by Remy Martin vs. Stanford.